60″ discharge height, 60° discharge angle, 150° rotational arc. 12″ discharge projection with a 30″ wide tapered pour chute. 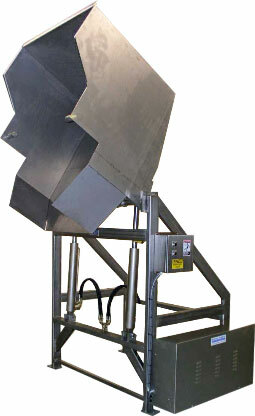 Pour chute design prevents foreign material from entering the product stream. Loaded via forklift truck at approximately 28″ above floor level. Product contact surfaces are 304 stainless steel with continuous TIG welds. Washdown duty 304 stainless steel tubular construction with continuous welds. Pivot carriage rotates on four-bolt corrosion resistant nickel-plated flange bearings. Rigid stainless steel hydraulic lines. Totally self contained 3 GPM Barnes hydraulic pumping unit. Hydraulic system housed in an enclosure for easy equipment cleaning. Controls mounted in a Hoffman NEMA 4X stainless steel enclosure.